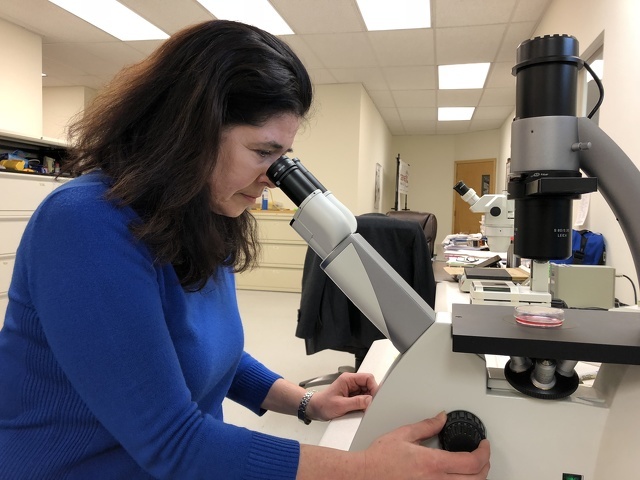 Sherrill Sonsteby, laboratory director at Pregenix in Boalsburg, looks through a microscope at fiberglass skin cells that are part of the cloning procedure. LBOALSBURG — In a small lab in an office building in Boalsburg, a startup company is performing a cloning procedure for cattle that is new to the United States. By using this technique, called handmade cloning, Pregenex can produce cloned cattle for livestock or milk producers at a less expensive price than traditional cloning practitioners. Waybright and Sherrill Sonsteby, laboratory director at Pregenix, learned this new procedure from Professor Gábor Vajta, a world-renowned Australian embryologist, and created their first handmade embryo in December 2017 by using tissue from a cow’s ear. The handmade procedure is more efficient and allows them to cut cost by using less expensive equipment and a more hands-on technique that involves a very small lab knife instead of expensive machines. Once the pair create the embryo in their lab, they then let it grow for 10 days before they implant the embryo into a cow as a fetus. A traditional clone of cattle would cost $20,000, said Waybright. Pregenex offers the procedure for $6,000. What are the benefits of cloning? Waybright is a former veterinarian who also works on in-vitro fertilization of cattle for Pregenex. He said that cattle have been bred and selected for specific ages so that certain traits have been passed down, allowing farmers to produce the best-quality herd that is possible. He said that in-vitro fertilization has been a common procedure for quite some time, and that cloning is another step in the same direction. “It is about passing on the best genes on to a herd. With cloning, we can produce the exact match of a desired cattle,” said Waybright. He said the clone will then pass that trait on to the rest of the herd through normal breeding process. Sonsteby said creating the embryo is a very precise procedure that requires a lot of concentration, but it is an exciting feeling to see the process come all the way through when they successfully impregnate a cow. “Examples of traits that can be optimized using handmade cloning include health variables, resistance to certain diseases, high milk production and better quality carcasses. These variables then pass down to the herd,” said Waybright. Sonsteby added that cloning has been going on for 20 years and that people have been consuming cloned animals whether they realize it or not. Sonsteby points to a seven-year study by the FDA that said there was no adverse affects caused by consuming cloned animals products. She added that the use of cloning can provide a product that has fewer chemicals than other products. “Cloned cattle, because they choose to clone a healthier, desirable cattle, may need less hormones, steroids and antibiotic, which will mean that there is less of those things in the farm product,” said Sonsteby. “We are trying to reintroduce cloning with this new technique. It is cost-effective and you can create a herd that is more efficient, uses less feed, produces lest waist. So, there are a lot of positive benefits of cloning,” said Waybright.